1. Secure the VESA Local Monitor Mount to the back of the monitor using the included screws or screws including with monitor. 3. Connect the VESA Local Monitor Mount to any 1/4″-20 tripod thread, 3/8” tripod mount, 5/8” Baby pin, and an Arca-style mounting system. 1. To clean your Rock Solid VESA Local Monitor Mount for Stands and Tripods use a damp towel or soft cloth. DO NOT use harsh chemicals or abrasive cleaners. 4. 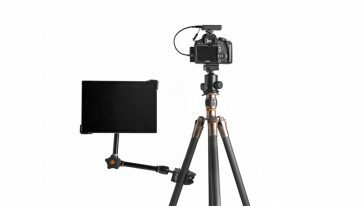 The Rock Solid VESA Local Monitor Mount for Stands and Tripods is rated to hold equipment up to 35lbs (15.88kg). However, always refer to maximum load limits on stands and tripods. Those weight limitations ALWAYS take precedence. For larger monitors, always position the display over one of the stand legs. The use of a sandbag on the leg opposite the monitor is recommended.